At 39-years of age, Kimmo Timonen has been around the block a time or two. In 15 seasons, seven with the Flyers, the Finnish defenseman has played in over 1,000 NHL games, while joining the league’s 500 point club. But as he skates in what is likely to be his final season in the league, the Flyers will soon have an opportunity to properly commemorate the end of an era in Philadelphia. Kimmo Timonen and the Flyers are approaching an end of an era that includes seven seasons and 268 regular season points. End Of An Era For A Hockey Iron Man? At 5-10, 194 pounds, Kimmo Timonen is far from the prototypical big-bodied defenseman that are not in short supply in the NHL. Despite his lack of size on the blue line, Timonen has maintained a high level of play for 15 seasons in the league with the type of durability that leaves most of his peers envious. With the exception of his first two seasons in Nashville, and last year’s lockout-shortened season, Timonen has played in at least 70 games each year, which includes a stretch of 248 consecutive games played in between. While missing only four games this season, Timonen is second in points by Flyers defenseman, scoring five goals and adding 33 assists. His plus-six rating is equal to team captain Claude Giroux, and his 20:21 of average time on ice makes him one of five Flyers who average over 20 minutes on a game-to-game basis, despite being the oldest active member of the team. The Flyers will enter the playoffs with their assistant captain’s familiar presence. Along with Brayden Coburn, who leads all Flyers in average time on ice, Timonen will make up Philadelphia’s top defensive pairing. Timonen’s minutes, however, are only a portion of explaining his value to a team that moved a mountain to gain postseason eligibility. “Timonen is 23rd among NHL defensemen this season in terms of quality of competition faced. He spends nearly as much time on the ice with shutdown center Sean Couturier (32 percent) as he does Claude Giroux (40 percent). An End Of An Era, Or One More Season? Considering his age and contract status, expiring at the end of the playoffs, much speculation has amassed as to whether or not this would be it for the four-time All-Star. While the answer is anything but definite at this point, predicting Timonen’s decision can best be done by evaluating two things: Whether or not the Flyers win the Stanley Cup, and whether or not he feels he can compete at the level he’s established throughout his career. At 39, Timonen has naturally declined in scoring and speed, despite his consistent availability. And as the years add up, Timonen, like any professional athlete his age, is finding out just how much more difficult it is to get the expected output from his aging frame. 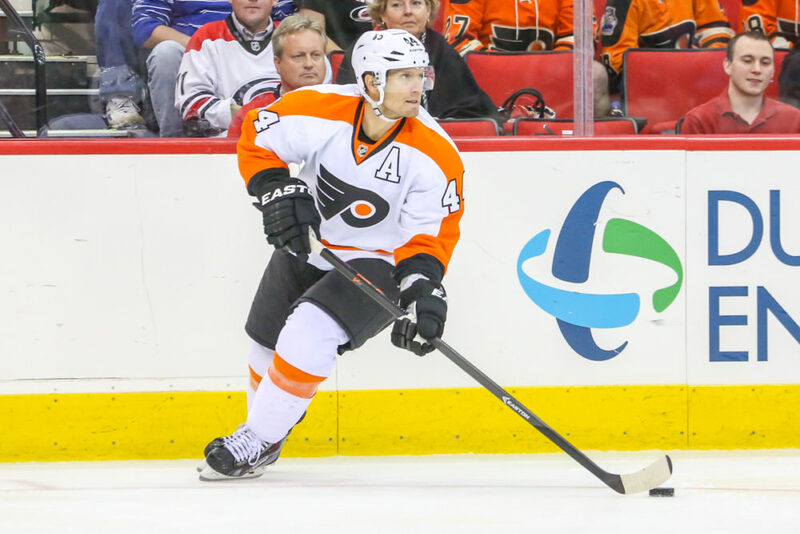 Should Timonen not feel satisfied enough to walk away this year, re-signing the long-time Flyer shouldn’t pose any difficulty to GM Paul Holmgren, as well as the team’s salary cap status. 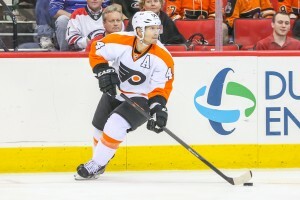 With Holmgren commited to locking up fellow defenseman Andrew MacDonald, allocating the funds to keep Timonen in orange and black would more than likely stand as one of Holmgren’s easiest tasks of the offseason. With the cap increasing, and Timonen’s value of around $6 million, the decision is strictly up to Timonen himself. Entering his ninth playoff appearance, Kimmo Timonen is 0-for-8 in his quest to lift hockey’s most coveted prize. In fact, Philadelphia’s six-game Stanley Cup defeat at the hands of the Chicago Blackhawks in 2010 was the closest he’s gotten to the ultimate goal. So what better way to end an era than by hoisting the Stanley Cup a la Ray Bourque in 2001? Just sat down with Kimmo Timonen and when pressed whether this was his last season he responded "probably is." Will re-evaluate in summer. Kimmo Timonen says once again he'll consider retirement in summer, but really made it sound like next year is a possibility to return. Not only would a Stanley Cup Championship hush the lame “1975” insults hurled at the Flyers and their fans, it would be the proper send-off to cap off an end of an era for Timonen and the Flyers. Capturing the elusive Stanley Cup would justifiably reward Timonen for his services, whether it be in production or mentorship. 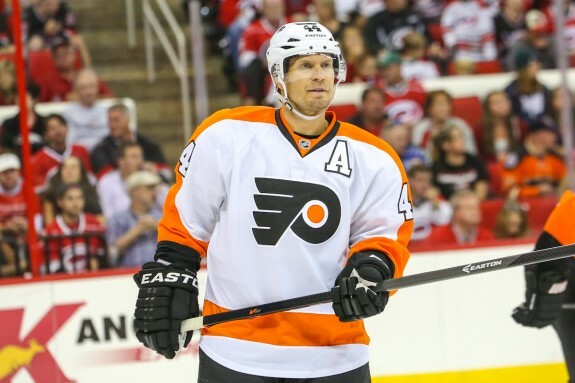 Timonen’s invaluable intangibles would certainly be enough for the Flyers to welcome him back next season. But if the two parties had it their way, the issue of unsettled business would finally be settled come June. Until then, the guessing game will only have to continue. Whether it’s this year or next, retirement is inevitable; and when you’re Kimmo Timonen, you’re just fine with that.